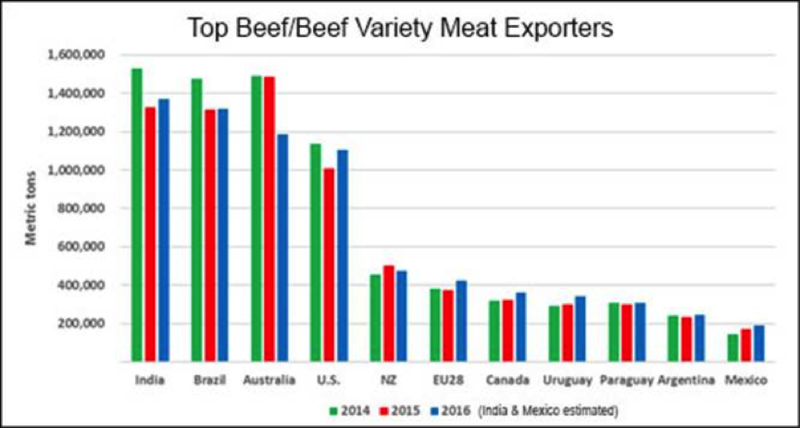 The U.S. gains ground as a world beef supplier while lower beef exports from Australia offset larger volumes from other top suppliers. The U.S. was the world’s largest beef exporter on a value basis in 2016, surpassing Australia’s $6.04 billion. Overall export value for the top 11 suppliers dropped again to about $31.7 billion, down 6% from 2015 and 14% below the 2014 record. With gains by some suppliers offset by a big decline from Australia, 2016 global beef exports held steady with the previous year’s volume. Exports from the world’s 11 leading suppliers totaled about 7.3 million metric tons (mt), down 6% from the 2014 record of 7.77 million mt. The United States had the largest year-over-year growth of the top four exporters, with U.S. export volume increasing 11% to 1.19 million mt, valued at $6.34 billion (+1%). A full summary of 2016 U.S. beef exports is available online. Unit export values for all major exporters fell in 2016, but for the U.S. this was more of an adjustment following significant increases in prices in 2014-2015. For South American suppliers, the decline was more dramatic, as many of their main export markets continued to struggle from relatively slow economic growth, low oil prices and weak currencies. With the Australian industry entering a period of major, post-drought herd rebuilding, exports totaled 1.2 million mt. This was 19% below the large volume posted in 2015, but still up 5% compared with 2012 – before Australia’s drought-induced surge in beef production. It is also important to note that Australia’s grain-fed exports declined just 1% from the 2015 record, totaling 260,000 mt. India was 2016’s volume leader, with exports through November up 4% to 1.22 million mt. Despite the increase in volume, export value fell 3% to $3.6 billion. Much of India’s “beef” exports are domestic water buffalo. Vietnam accounted for 46% of India’s total volume, up from 40% in 2015, with the remainder of exports mainly bound for the Middle East and other Southeast Asian markets. A major development for India was gaining the ability to export to Indonesia, but access to Indonesia is now in limbo following a court ruling that questioned the process Indonesian regulators used when opening the market. Brazil’s exports ended 2016 steady with the previous year, with a slowdown in the second half, due in part to a strengthening currency, offsetting strong early results. Brazil’s exports totaled 1.32 million mt, with solid growth to top market China/Hong Kong and increases to Chile, the U.S. (mainly cooked beef), Saudi Arabia, the Philippines, the United Arab Emirates and Singapore. These gains were offset by lower exports to Egypt, Russia, the European Union, Iran and Venezuela. Although Brazil started shipping frozen beef to the U.S. in September, 2016, exports totaled just 846 mt. Canada’s exports were up 12% year-over-year to 360,587 mt. Exports were sharply higher to the United States (270,540 mt, +17%) – which is still Canada’s dominant export market, accounting for 75% of total volume. U.S. net imports of Canadian beef moved higher in 2016 (153,557 mt, +45%), due in part to the strong U.S. dollar. New Zealand’s exports slowed in 2016, decreasing 7% to 463,266 mt, although exports were still above 2014 levels. Exports to the U.S. were lower (195,337 mt, -14%), but still accounted for 42% of export volume. Exports also declined to China, Canada and the EU, but were larger for Korea, Taiwan, Japan, Indonesia and Australia. Uruguay’s 2016 exports were record-large at 348,587 mt, up 17% and surpassing the 2006 record by 4%. Although export value ($1.55 billion) was just short of the 2014 record, Uruguay’s unit export value was down nearly 14%, partly driven by surprisingly large production. China was the dominant market, taking 51% of Uruguay’s export volume. The EU moved into the No. 2 slot with Uruguay currently being the largest beneficiary of the EU’s duty-free grain-fed quota. Paraguay’s exports increased 2% to 306,449 mt, led by growth to neighboring markets Chile and Brazil, as well as Vietnam and Israel. These gains were mostly offset by lower exports to Russia, Kuwait, Iraq, Hong Kong and Gabon. Argentina’s government recently took another step forward in support of exports by reinstating export refunds, ranging from 2.5% to 4% of export value, but this policy was not yet in effect in 2016. Argentina’s exports were up 9% to 253,434 mt, including strong growth in frozen exports to China and chilled beef to the EU. But Argentina’s herd-rebuilding continues to limit overall production and exports and is putting upward pressure on prices, despite a weaker peso. Mexico’s exports were up 13%, totaling 179,000 mt through November. The U.S. accounted for 90% of Mexico’s export volume, with Japan, Hong Kong, Canada and Korea rounding out its top five markets. NOTE: Export totals based on Global Trade Atlas data and U.S. Meat Export Federation estimates. Totals include both muscle cuts and variety meat, unless otherwise indicated.